So: Constantcon 2011 puts it into my head that Google+ hangouts might be good for running games for far-flung folks. 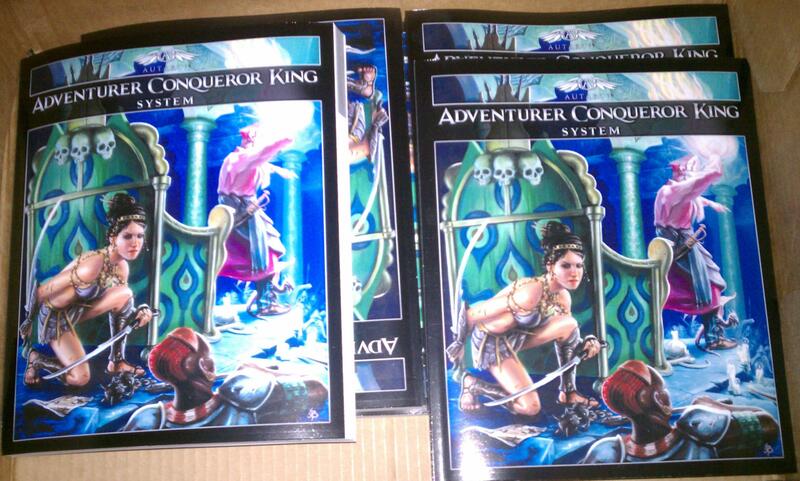 And those who’ve backed Adventurer Conqueror King on Kickstarter are nothing if not far-flung. It’s hard to keep people’s real names and online handles and Kickstarter logins straight, but just from the blogs I can connect I know we’ve got people in Australia and England and Southern California and Florida. It’s cool that fantasy gaming has spread so far from its Midwestern cradle, but it makes it hard to throw our supporters the big party they deserve. These ideas, and a few beers plus, are kicking around my head this Friday at like 11:30 New York time/8:30 LA time when Zak S. posts on Google+ to start a game. On the Autarch developer forums, Adam who I know from Anonycon is talking about playing via G+ too. Thus at 1 am my time do I find myself running Borshak’s Lair using ACKS for these guys plus two others I hadn’t met before but hope to see again, most likely online because one of them lives in Australia. And lo, it is fun! That’s not revelatory – when is gaming not fun? – but the G+ hangout works really well. It prioritizes audio over picture, so you keep continuity of what people are saying even if the connection weakens. It handles multiple inputs well, although Zak pointed out it’s best to have an “initiative order” to reduce folks talking over each other. There’s a chat window you can use to post stuff like character stats or multi-task; I was sometimes talking to answer one question and typing for another. And there’s an endearingly analog aspect to drawing a map with a Sharpie and holding it in front of your webcam, or picking it up off the monitor to point at the dice you just rolled on the desktop. Shortly after, our Kickstarter effort hits its previous bonus goal, and we need to set a new one. It shouldn’t be a new product, because Ryan’s illustrating time is already a bottleneck. But it should be something cool, worth striving for. The result? If we triple our initial funding target, we’ll set up a game of Adventurer Conqueror King via Google+ for each and every one of our backers. Given that there are currently 150 of our Kickstarter donors, this is a massive undertaking. You might call it insane. But I think it can be done – both the part where we raise the difference between $8,292 in four days, and the part where we then fulfill the promise of getting the requisite number of hangouts together. Why do I think this is possible? Partly because our stunning success to date has left me, well, stunned. Partly because we live in the future, where the gap between Adjua on the left (seen here with a proof of the book) and the box of books on the right can be navigated by that photocopier/computer/steampunkish glass box (clearly the product of cross-breeding by a mad wizard) seen behind her in just a few days. And partly because I like gaming so much that any amount of time spent making it happen seems reasonable. 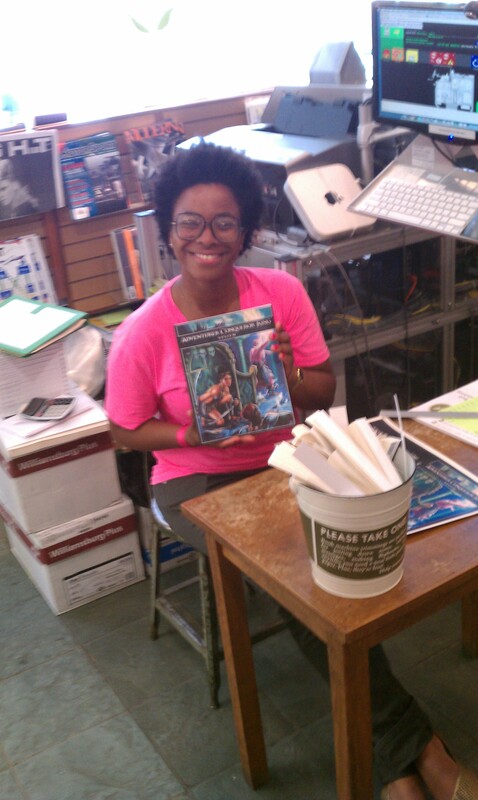 Someone is very happy to be holding a copy of ACKs in that picture. Who is that? That’s Adjua, I namechecked her and linked to her blog in a previous post. Making books is presumably a routine thing for her, I think we’re seeing my joy over seeing it rubbing off on her. One of the other McNally Jackson employees was inspired by making “Cheers Gary” and “ACKS” to invite her and her boyfriend’s friends over to play D&D, which’ll be her first time; how cool is that? « Gold pieces are absurdly huge: do you like it that way?